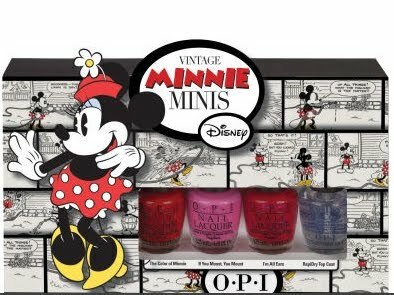 My lovely friend Sammy gave me the OPI Vintage Minnie Mouse Mini's Collection for Christmas and I thought I'd share with you all my favourite colour. I'm not much of a nail polish junkie, I've been a terrible nail biter up until a few years ago and my nails break and split so quickly that I've generally always had acrylics or shellac done. This colour is called "I'm all Ears" and is described as a "a shimmery, glittery sheer red" but as you can see below it's much more pink than red. I love the mini bottles as a big bottle of nail polish is not something I'm ever likely to use up. I used a base coat, two coats of I'm all Ears and the rapidry top coat. I got about 3 days wear out of this before it got chipped but that's about usual for me. Unfortunately for me I accidentally left this bottle on the edge of my bathroom counter and it was knocked off and smashed into tiny smithereens all over the bathroom tiles :( Eeeek! Managed to clean it all off - thank God but I wasn't very happy about it!! That's a really pretty colour Kayte, I am so sorry you smashed it. I have Nothin' Mousie 'bout it from that collection, glitter with hearts, it's gorgeous. I hope you can find another bottle.